or at least talks about HUGS. . .
H A L L O W E E N I S T O D A Y. . . When was the last time you actually went HALLOWEENING? When was the first time you actually went Trick or Treating? What was your favorite Halloween outfit? Was it reflective on WHO YOU WANTED TO BE? WOULD YOU DRESS UP IN THE FASHION OF WHO YOU ARE NOW. . .
Or Would you Dress as Someone Else? EVERY DAY OF THE YEAR, isn’t it? THE FEAR THAT WORLD IS GOING TO FIND US OUT. . .
Just for RELIEF. . .It’s exhausting taking on/off/on/off/on/off/on/off all of these Masks, plus you forget WHO YOU really are. H E Y. . .
Halloween was yesterday. . . Think about taking your Masks off. . .
we took off all of our masks. . .
there would still be more? Seriously have you ever seen/viewed/spied your bare, truest self? Have Y O U ever seen Y O U ? Give them NEITHER. . .
G I V E T H E M Y O U! maybe the best Halloween of all. . .
is actually no Halloween at all! and l o s t. . .
B a t m a n. . .
Top selling movie over the past couple of weeks. . .
or petty criticisms. . . Steal these tips from the pros. You can be an absolute expert within the field of finding happiness and still need a little help yourself. “We have the same problems as our patients,” said David D. Burns, a clinical psychiatrist and author of bestselling psychology book Feeling Good: The New Mood Therapy. And sometimes that means dealing with negative thoughts, anxiety and bad moods. If you’re feeling overwhelmed by a task, chore, conflict, to-do list ― and it’s totally sabotaging your mood ― try tackling just a small piece of it, Burns said. “The thing I choose to do has to be something I can complete in about 30 seconds, that way I can’t give myself any excuses to procrastinate,” he explained. For example, Burns said that day he was feeling particularly overwhelmed by piles of paperwork on his desk, so he put his method into practice immediately. He took 30 seconds — all while on a call — to put a few pieces of paper together, staple them and file those papers properly in his file cabinet. It’s ridiculously simple, but Burns said he felt a marked improvement in his mood immediately. “You feel a little bit of a boost every time you do this,” he said. This tip is the oldest trick in the book for a reason. According to Habib Sadeghi, a holistic health expert and author of The Clarity Cleanse, taking a few large breaths can activate your parasympathetic nervous system, a part of your overall nervous system that’s responsible for lowering your heart rate and blood pressure. Taking a few deep breaths is also “a way to get out of the head and into the body,” Sadeghi said. To try it yourself, start with a forceful exhale to clear some of the air from your lungs. Hold this for a second or two, then inhale deeply, allowing your abdomen to expand. Count to seven as you inhale, then hold your breath for about the same amount of time. Then exhale slowly for about 14 seconds or so. Repeat this for about 10 cycles, preferably on the edge of a chair with your eyes closed. It might be tempting to squash your terrible mood by suppressing that negativity, but you’re actually not doing yourself any favors. Instead, experts tell their patients ― and themselves ― to let themselves feel whatever emotions that pop up. “Don’t tell your feelings to shut up. Instead, ask ‘what’s up?’” said Heidi Ligouri, a licensed counselor and motivational speaker. She added that ignoring a feeling can often make a situation worse. Taking the time to process feelings can also help you get into a happier mindset more easily. There’s no reason to feel bad about feeling bad, said Kathleen Dahlen deVos, a psychotherapist based in San Francisco. She calls accepting negative feelings “emotional fluency,” which means experiencing your emotions “without judgment or attachment.” This allows you to learn from them, use them or move on from them more easily, Dahlen deVos said. Self-criticism comes easily for most people, especially when they’re in a terrible mood. So, once you’ve acknowledged you’re feeling crummy, counter that with a little emotional TLC. If your bad mood is caused by a mistake, or if you’re thinking negatively about yourself, interrupt that stream of consciousness by picking out one thing you like about yourself. For example, maybe you prioritize hanging out with your sister, or you’re a team player at work, or you volunteer every month. Just something that gives yourself credit for your attributes. It sounds like a corny exercise, but it might just work. Still need some convincing that this technique isn’t bogus? Research shows that this practice also can help protect you from anxiety depression. Let’s say you showed up 20 minutes late to a meeting and halfway through your important presentation, you noticed you had a massive coffee stain on your shirt. You get through the meeting, but you’re angry about the circumstances afterward. In this situation, Ligouri said she figures out her next step by asking herself what she needed. “Ask yourself: Do I want to keep rolling around in upset? Do I want to create or recreate a commitment to living a happy healthy life? Do I just need a nap? Do I want to reach out to a friend?” Ligouri said. In other words, figure out what to do next ― even if it’s just a simple task ― and then commit to doing it. Maybe not literally, but at the very least get outdoors. Each expert said they rely heavily on this activity as a way to improve mood. “I make it a point to get fresh air and incorporate movement into every day,” Dahlen deVos said. “Sometimes this means a yoga or fitness class, but often it’s just a morning hike with my pup or an afternoon walk around the neighborhood during a free hour.” Her secret weapon? Doing this phone-free. You also get the added benefit of exercise, which is its own mood booster, Sadeghi said. Dahlen deVos said she keeps a set of mantras in her back pocket, and recommends the same for her clients. “Develop a self-compassion mantra: an easy-to-memorize set of phrases to repeat when we need a compassion boost, or to create mindfulness of a situation,” she said. There’s a reason pet owners tend to live longer. Spending time with a dog, cat, or another animal can be profoundly calming and uplifting. Burns cited time with his sweet rescue kitten Misty as one of his all-time favorite mood-boosters. Sometime this Clown doesn’t much like Clowning. . .
w h a t ‘ s y o u r ‘ s ? When it comes to insights about work, there are tweaks and there are game changers. Which isn’t to diminish tweaks. Sometimes, the perfect scheduling hack or productivity ritual can radically improve how much you get done. But no hack or routine will change the fundamental way you view your work — how much satisfaction you get out of it, the way you see your work relating to the rest of your life, the terror you feel about your inadequacies. For that, only wisdom will do. Helpfully, creativity site 99U recently dug out more than a half dozen gems of just this sort of wisdom, and what’s even better for the time pressed, one of the best of them is only two words long. It comes from celebrated author Kurt Vonnegut, who penned this succinct nugget of professional wisdom in response to a high school student who was given the assignment of writing his favorite author. 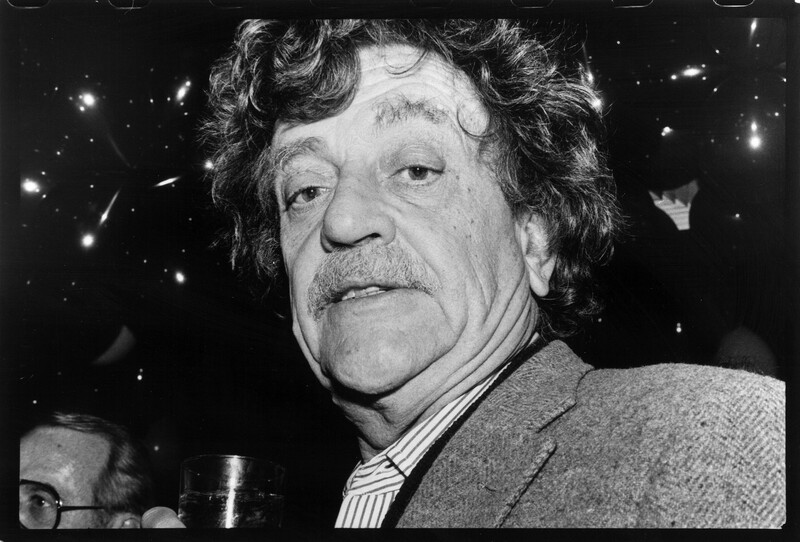 Vonnegut’s kind reply included these two powerful words: practice becoming. Seriously! I mean starting right now, do art and do it for the rest of your lives. Draw a funny or nice picture of Ms. Lockwood, and give it to her. Dance home after school, and sing in the shower and on and on. That sounds pleasant enough, but why is it so profound? Sure, Vonnegut’s advice jives with scientific research that shows exercising your creativity will make you happy even if you’re terrible at your chosen form of self-expression, but that’s far from the most powerful part of this dead simple but potentially life-changing message. Like many wise thinkers, Vonnegut recognizes that “success,” if you view it as a single, final destination, will always be out of reach. There will always be someone you can compare yourself to and find yourself wanting. There will always be more to want and more to dream. Instead of working to reach some fixed goal (and planning on finally enjoying yourself then), enjoy the the process of working and living itself, the self-exploration and moment-by-moment accomplishment it gives you. Or, in other words, you’re always going to be in the process of becoming who you want to be, so you may as well get good at becoming and learn to enjoy it. It’s a powerful message for our endlessly ambitious, angst-filled age. Looking for more down-to-earth wisdom from Vonnegut? Here’s his letter in its entirety, including a fun “assignment” he gives the young man who reached out. You could give it a try yourself if you want to practice becoming yourself tonight. Originally published at www.inc.com. . .
It’s the only answer that matters. . . YOUR TRUE COLORS . . . Mess on a Canvas. . .
Have you ever felt like you don’t belong? and you don’t actually deserve your job and accomplishments? If so, you’re in good company. . . These feelings are known as impostor syndrome, or what psychologists often call impostor phenomenon. An estimated 70% of people experience these impostor feelings at some point in their lives, according to a review article published in the International Journal of Behavioral Science. Impostor syndrome affects all kinds of people from all parts of life: women, men, medical students, marketing managers, actors and executives. What is impostor syndrome ? Impostor syndrome—the idea that you’ve only succeeded due to luck, and not because of your talent or qualifications—was first identified in 1978 by psychologists Pauline Rose Clance and Suzanne Imes. In their paper, they theorized that women were uniquely affected by impostor syndrome. Since then, research has shown that both men and women experience impostor feelings, and Clance published a later paperacknowledging that impostor syndrome is not limited to women. (She also created an impostor syndrome test.) Today, impostor syndrome can apply to anyone “who isn’t able to internalize and own their successes,” says psychologist Audrey Ervin. “Perfectionists” set extremely high expectations for themselves, and even if they meet 99% of their goals, they’re going to feel like failures. Any small mistake will make them question their own competence. “Experts” feel the need to know every piece of information before they start a project and constantly look for new certifications or trainings to improve their skills. They won’t apply for a job if they don’t meet all the criteria in the posting, and they might be hesitant to ask a question in class or speak up in a meeting at work because they’re afraid of looking stupid if they don’t already know the answer. When the “natural genius” has to struggle or work hard to accomplish something, he or she thinks this means they aren’t good enough. They are used to skills coming easily, and when they have to put in effort, their brain tells them that’s proof they’re an impostor. “Soloists” feel they have to accomplish tasks on their own, and if they need to ask for help, they think that means they are a failure or a fraud. “Supermen” or “superwomen” push themselves to work harder than those around them to prove that they’re not impostors. They feel the need to succeed in all aspects of life—at work, as parents, as partners—and may feel stressed when they are not accomplishing something. Why do people experience impostor syndrome ? This is especially true “whenever you belong to a group for whom there are stereotypes about competence,” Young adds, including racial or ethnic minorities, women in STEM fields or even international students at American universities. You can also reframe your thoughts. Young says she reminds people that the only difference between someone who experiences impostor syndrome and someone who does not is how they respond to challenges. “People who don’t feel like impostors are no more intelligent or competent or capable than the rest of us,” Young says. “It’s very good news, because it means we just have to learn to think like non-impostors.” Learning to value constructive criticism, understanding that you’re actually slowing your team down when you don’t ask for help, or remembering that the more you practice a skill, the better you will get at it can all help. It can also be helpful to share what you’re feeling with trusted friends or mentors. People who have more experience can reassure you that what you’re feeling is normal, and knowing others have been in your position can make it seem less scary. If you want to delve more deeply into these feelings, Ervin recommends seeking out a professional psychologist. It’s true, huh. . .
but the very one we resist the most. . . It really is the irony of all ironies, isn’t it? We spend all of this time with ourselves. . .
but it’s as if we don’t know ourselves at all sometimes, huh? W H O A R E Y O U? WHAT WE WANTED TO DO BUT. . .
and I don’t know. . .
but it doesn’t have to be any longer. . .
isn’t as frightening as you have ever thought. . .
T R I P O F A L I F E T I M E! 1) What do you really believe? This isn’t a final Philosophy 101 exam where your answers will be posted for the Universe to see. Is what you believe about Love, God, Spirituality, Life, Relationships YOUR BELIEFS or those that have been passed down to you from others? 2) What do you value? If someone were gushing about you, what would you feel best about what they would be saying? What do you admire most and value best in another person. Do you possess those qualities…do you really want to have them be YOU? 3) What makes you the happiest? Most of the time we think HAPPINESS is something that someone else is, but not really ever us. So are you really doing/being what you want, or did you settle for the HAVE-TO, instead of your WANT-TO? 4) What scars are still seeping? HINT: Usually the things that still cause an emotion in us are the things that still need healing. That’s NOT a bad thing…IT’S A REAL THING that you needed look away or try to cover up. Healing takes time…sometimes a lifetime and THAT is what a LIFE TIME is about. 5) What do you love about you? No, we’re not going to get up and share what we’ve barely seen a glimpse of ourselves. . .but we rarely need a mirror to reflect what makes us shine the best. You really do know your strengths, your successes, your attitudes, your friendships and relationships–what you are really thankful for in yourself. O U R S E L V E S. . .
has kept us from us. . .
—which is not a virtue. . . The mirror is not always kind. . .
is not always the most pleasant of journey’s. . .
You don’t need. . .
Book that trip. . .
(n o r s h o u l d). a g a i n. . .
over and over and over again. . .
Have you ever begun again? The 2014 movie, BEGIN AGAIN with Keira Knightley and Mark Ruffalo is hardly Academy Award winning in any aspect, but, just the same, this is my favorite scene where Ruffalo’s drunken record producing character imagines instruments playing. And you. . .when does the magic happen for you–in your head. . .in your heart. . .in your soul. . .? Just because we don’t say IT out loud doesn’t make it any less powerful. Forget all of the great speakers you thought were awesome, or motivational, or inspirational or inciteful. . .
What we think between our ears is more herculean than any other message heard or read. Dare you harness THAT imagination? Dare you leash THOSE thoughts? Your imagination is the most influential force you’ll ever encounter. . .
or you’ll ever need. . .
let your eyes close slowly. . .
have already tapped your baton on the podium. . .
pick a couple of Rocks. . .
but not just ANY Rocks. . .
D i s c a r d from your Life. so we and no one else will ever know of them again or ever. that Misfortune in your life. . .
Take a walk with me to this pile of Rocks. and keep one that represents all that is precious to you. See it a nice body of water lapping at the shores before you. Now with all of your might, do it! H E A V E I T ! G o o d T h r o w. . .
the r i p p l e s you created. . .
but it’s G O N E . . .
G O N E F O R E V E R ! G E T B A C K H E R E! What do you mean you’re going to go find your Rock? only to go and find it again? N o t T o d a y ! Let it be Gone. . .
It’s weighed you down too much for too long. . .